Trail system, located near Juniper Hills Park, will feature trails for biking and horseback riding. 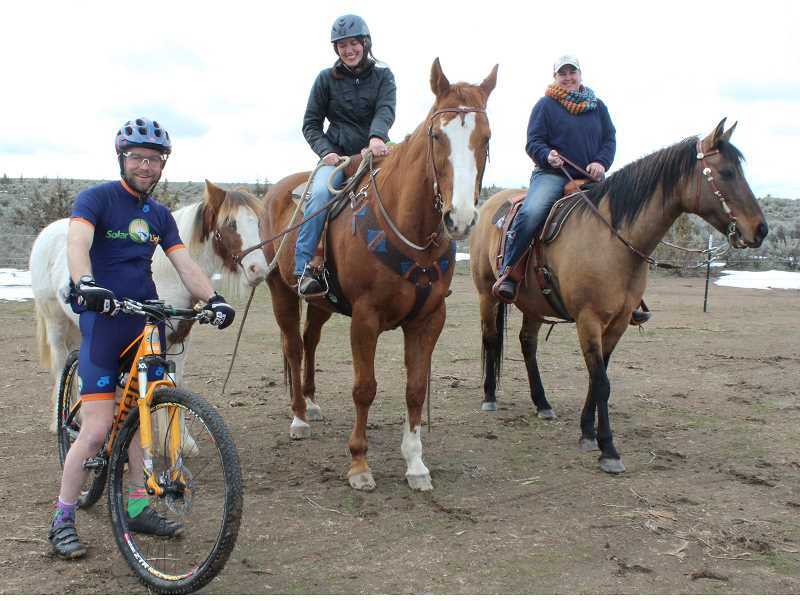 The Madras area will soon boast a new recreational opportunity — and a new tourist attraction — due to a joint project by the city of Madras and the Central Oregon Trail Alliance to create a set of trails east of town for mountain biking, running, walking, and horseback riding. The East Hills Trails will be located on a 526-acre parcel of city-owned land accessible from Ashwood Road. The parking lot, completed in December, is just beyond Juniper Hills Park on the opposite side of the road. Madras resident and founder of the Madras branch of COTA, Brennan Morrow, came up with the idea for the project not long after he moved to Madras from Sisters. Morrow enjoyed mountain biking in his former home and wanted to be able to do so in Madras, but he couldn't find a good mountain biking area close to town. "Our closest trail was about 20 minutes away and that put kind of a big burden on riding for me. Previously, I did a lot of riding, but in Madras my riding started to fall off," Morrow said. Morrow inquired at both the Crooked River National Grassland office and the city and learned that the city had some property that is slated for future development, but is currently unused. Legal issues stalled the project for almost a year, but the Madras City Council gave its final approval on Oct. 23, 2018, and city staff are now fully on board. "We're really excited about it. I like the idea that there are a lot of different uses. It's cool," said Jeff Hurd, the Madras Public Works director. Morrow said there will be two separate trail systems at East Hills — one for horses and the other for mountain biking. Runners and walkers can use either trail. Horses and mountain bikes will be kept apart for safety, Morrow said. "Mountain bikes move quite a bit faster and there's an inherent challenge with horses because horses spook easily. There can be a pretty high risk factor, for the horses primarily," he said. The horse community is at least as excited as the mountain biking community to have a trail closer to home, according to rider Tori Reid. "A local trail riding group named 'Spur of the Moment' has been very much involved and will continue to be so," she said. "To have a local trail system will be a godsend for many of them, being able to ride without having to waste half the day getting to the location or spending half a tank of gas to get to the trailhead. I'm also looking forward to watching the local horse community grow." Morrow said runners from Redmond and Prineville, as well as Madras, will use the East Hills Trails for cross-country running, possibly even for high school or club competitions. "This trail system is going to be perfect for cross-country running because of the kind of terrain it is and the dirt is the right composite for good running and riding," he said. Each type of trail will be about 10 miles total. The biking/running/walking trail will include a 3-mile loop and a 5-mile loop, which can be done together as a figure 8. The horseback riding trail might also feature some obstacles or training stations that riders can use for practicing skills, such as stepping up onto something, backing up, or maneuvering so that a rider can open and close a gate without getting off the horse. The city graded the parking lot in December and COTA supplied the labor and materials to fence it. The parking lot is large enough for trucks pulling horse trailers and has a man-gate at the southeast corner where the trailhead will be. COTA had time to do about 60 percent of the trail flagging before winter set in. Work is suspended for now, but will resume when weather permits, with the goal of completing the trails by July. Once COTA has the trails laid out and recorded on GPS, they will ask the city to approve them. After that, COTA will refine the flagging and lead volunteers in cutting the trails. "Here in Madras, we're going to do some new things that are not often done in trail building," said Morrow. "First, we're going to work with our horses. With any luck, we'll be able to use horses to pound the trail and break it, reducing the amount of man hours we have to put into it." Reid, an avid horseback rider, is eager to help create the trails. "I absolutely will be helping with doing the initial trail breaking and will be doing it with a group of local riders that are also very excited about this trail system," she said. "It's an ideal plan because of the time of the year; the ground will be soft and the horses will be able to blaze a trail without causing much damage to the surrounding terrain," said Reid. 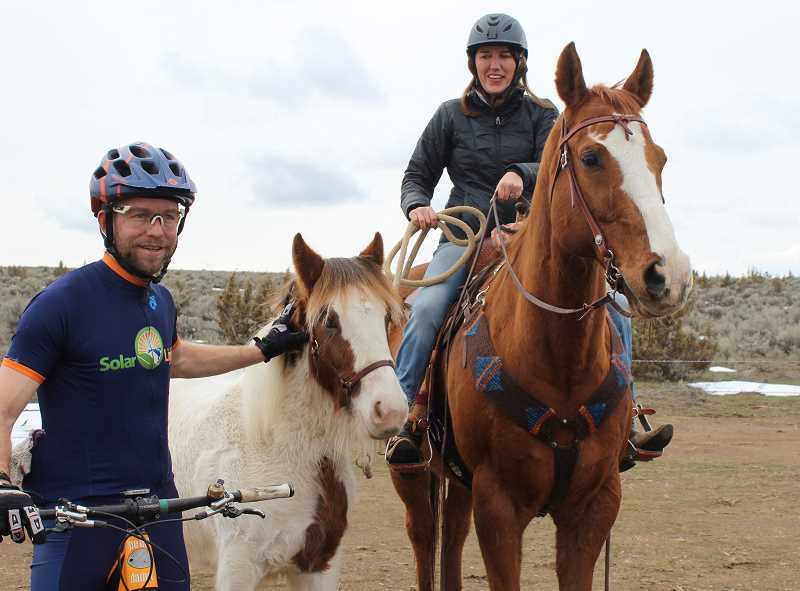 Morrow hopes that using horses to build the trail will also build a good relationship between two different user groups that don't always jive. "Horses and mountain bikers have a challenging relationship due to the fact that they share trails and it hasn't always been great," he said. After the horses do the initial work on the trails, COTA volunteers will set to work with Pulaski tools, which are a cross between an axe and a hoe and are used by wildland firefighters to construct firebreaks. Morrow said inmates from the prison might provide some of the labor for the trail-building, as well. COTA plans on installing some benches for people to rest and enjoy the stunning mountain views, which are an integral part of the trails' allure. The city will put in some signage in the parking area to identify the East Hills Trails and post the necessary usage rules. The project is a good deal for the city, which will be able to add a recreational opportunity for area residents with minimal expense. The $15,000 COTA has budgeted for the project will cover fencing, signage, benches, a picnic table, bike racks, a dog bag station, and more. COTA advanced its own money on the fencing already installed and will likely be reimbursed for that and get the rest of the money it needs from the Rotary Club's annual Cherry Tree fundraiser in May. The East Hills Trails project was one of several strong candidates that applied to be the recipient of the Cherry Tree auction, according to Jennifer Holcomb, one of the co-chairmen of the event. "It was a tough decision because there were several great projects. We had to vote a couple times to get a winner," she said. Holcomb said Rotary ultimately chose the East Hills Trails because the project would benefit all ages and many different types of users. Furthermore, the East Hills Trails will be self-sustaining because most of the maintenance will be done by volunteers. Equally important, the project has the potential to bring economic benefit to the whole community. COTA's presentation to the Rotary Club, which was prepared by Josh Farrester, included statistics on bicycle tourism gleaned from a 2012 study by Dean Runyan Associates. The study found that tourists who travel to bicycling destinations spent about $94 a day in restaurants and bars and about $81 a day on motels and accommodations. The East Hills partners are hoping Madras businesses will capture some of those tourist dollars. Morrow thinks people passing through Madras will take a break to use the new trails. "We sit in a very key spot for a lot of recreational users that go from Portland to Bend," he said. "We're sitting right in that perfect little stopping point that will entice a lot of users." Reid agrees that the trails are likely to bring more tourists to the area. "This trail system will be a great asset to the Madras community, both for locals and for outdoors enthusiasts across the state," she said. "Madras should be a destination like other Central Oregon communities. We have the same weather, the same beautiful views, and great people." In the long term, the parcel of land the East Trails are on will be incorporated into the city for housing development. "There's a master plan for Yarrow to build out into it," said Jeff Hurd. But that doesn't necessarily mean that the trails will go away completely. "We tried to set it up so that the trails get incorporated into the development," said Hurd. Morrow said that the trails could also eventually stretch out into the adjacent Crooked River National Grassland. Morrow has been mountain biking for about 20 years. He has built trails in remote Alaska and in the Sisters area and has sat on the board of COTA for more than three years. The Madras branch of COTA has about 15 members, eight of them core members. To keep up with COTA's progress on the East Hills Trails, check out the Madras Trails group on Facebook.